In 2006 we traveled to the village of Montalcino in the heart of Tuscany for the first time. Exploring the medieval streets without Betsy at my side, I bought the most expensive bottle of wine I had ever purchased. When she found out how much I paid she almost killed me; but a couple days later when we opened it, all was forgiven. That bottle sparked our interest in the wine world and fueled our passion for learning about and seeking out wines from around the globe. In honor of that memorable bottle. Let me tell you a little about what makes the wines of the Val d’Orcia so special. In the heart Tuscany, south of the stunning city of Siena, lay the beautiful rolling hills of the Val d’Orcia. Covered with vineyards, olive groves, and the iconic Cypress trees, this UNESCO World Heritage Site is home to two of Tuscany’s most important and most delicious wines, Brunello di Montalcino and Vino Nobile di Montepulciano. The cities of Montalcino and Montepulciano bookend this quintessentially Tuscan valley. Montalcino to the west sits atop a hill that is 567 meters above sea level - the views from the city’s imposing Fortress are absolutely stunning. 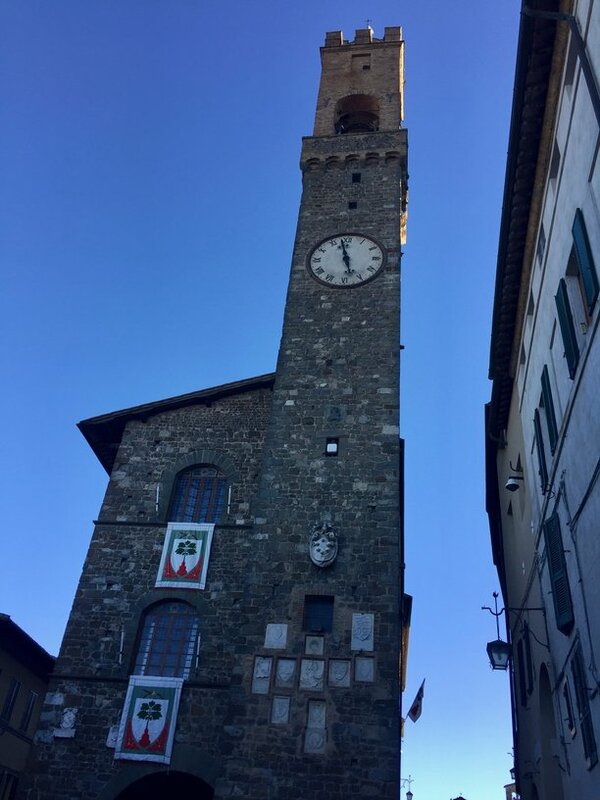 The village dates from the 9th century and it has become a tourist destination filled with cute boutiques, local restaurants, and enotecas (wine shops) showcasing Montalcino’s main attraction: Brunello. In 1980, Brunello di Montalcino and Vino Nobile de Montepulciano were among the first four wines to receive DOCG (Denominazione di Origine Controllata e Garantita) identification, Italy’s most prestigious appellation designation. Both wines are made with Sangiovese (the main grape used to make Tuscany’s other DOCG wine, Chianti Classico), are aged in oak, and are subject to very specific production techniques. There are also Riserva and more affordable Rosso versions of both wines. Brunello and Vino Nobile do share some characteristics of bright fruits balanced by high levels of acidity and tannins, but differences in soil types, climate, and vinification produce two bold but distinctly different reds. As Brunello is one of Italy’s most famous wines, you may be surprised to learn that it came into existence relatively recently. Although the term “Brunello” has been used to describe Montalcino’s wines since at least the 14th century, producer Ferruccio Biondi-Santi released what is regarded as the first modern day Brunello di Montalcino in 1888. Biondi-Santi was the only registered maker of this wine until after World War II and is still one of the area’s most prestigious producers. Under DOCG rules, Brunello must be comprised of 100% Sangiovese grosso grapes grown in a very small area surrounding the town of Montalcino. The wine must age for a minimum of two years in oak, four months in bottle, and it cannot be released until five years after the harvest. The Riserva wines must age a minimum of two years in oak, six months in the bottle, and are released after six years. Most wine makers age their wines in oak for much longer than the minimum. Traditional producers use large Slavonian oak barrels which tend to be neutral in flavor but allow for micro oxidation to occur during the aging process. Modern Brunello producers are having success experimenting with aging in barriques, which impart a subtle oak characteristic on the wine, without losing the character of the grapes. Long maceration times cause strong tannins and dark colors to develop in the wine. This combined with the natural high acidity of Sangiovese mean that many Brunellos require a long time in the bottle before the are ready to drink. Locals say it’s best to wait 10 years from the printed vintage before popping open that special bottle of Brunello. A cost effective alternative is a Rosso di Montalcino. These “Baby Brunellos” spend a minimum of 6 months in oak and can be released after one year. Shorter maceration times mean these wines are ready to drink when released and can be quite fresh and lighter in character than their big brothers. Up until recently Montepulciano’s noble wine has been somewhat under-appreciated, but in the past few years, it has started to become recognized as one of the world’s great wines. In this region the Sangiovese grosso clone is known as “Prugnolo gentile” but it is the same grape used in Brunello. The name Vino Nobile was first used by wine maker Andamo Fanetti in 1925. Vino Nobile DOCG allows for up to 30% of other grapes in the blend, but most of the top producers use 100% Sangiovese. The wine must age in oak for at least 12 months and can be released after two years. The Riserva must age three years before release and usually spends additional time in wood. Many producers have reverted back to using traditional Slavonian oak barrels after years of trying to produce bolder, heavily oaked wines. Because these wines have yet to achieve the acclaim of their neighbors to the west, they are often a bargain when compared to Brunello. The Rosso di Montepulciano are aged for shorter periods and can be released one year after harvest. They are some of the best bargain wines in the Toscana region. In general, Vino Nobile has a little more finesse than Brunello. Characteristic flavors are bright red fruits - cherry, plum, strawberry – fig, and tea leaves with softer tannins and nice acidity. This lighter character means the wines can be consumed a little younger but many will age nicely for 10 to 20 years or more. So, back to 2006 and our first visit to Montalcino. We had just started seriously getting into wine and this was our first wine focused vacation. We stayed in a stone farm house at Agriturismo La Crociona, a wonderful winery just south of town. One day I found myself in one of the enotecas near the Piazza del Popolo by myself. I asked the shop keeper to explain the difference between some of the cheaper wines I saw in baskets on the street and the more expensive ones in the shop. She walked me through a tasting of three well-known Brunello. The first was an entry-level wine and I don’t remember much about it other than it tasted like a lot of other reds I had tried at that time. The second was a bottle of Tenuta Caparzo, a wine we still enjoy from time to time. This was a noticeably better wine! It was more complex, with pronounced dark fruit flavors balanced by bright acidity and tannins. I couldn’t have told you all that at the time, I just knew I liked it better! Then she let me taste the third wine, a Tenuta La Togata, and I was blown away! The aromas and flavors were on another level and I was just overwhelmed with what I tasted. With out hesitation I bought a bottle. It was about 40€ which was by far more than I had ever paid for a bottle of wine at that point in my life. We took it back to our room and ended up drinking it the next night. We were told to let it breath for several hours before we drank it so we opened it on the morning before we went out exploring for the day. In the evening we set out a dinner of local cured meats, cheeses, bread, and olives we had collected during the day. Then we poured our first glasses. Every time I would lift my glass, long before it reached my lips, my nostrils were filled with the heady aromas. Dark berries, licorice, leather…it was incredible. And it just got better! We sat on our little porch and over a couple hours slowly drank the bottle. It was a light-bulb moment for us. It really spurred us into the world of wine we find ourselves in today. We have consumed many spectacular bottles of wine since, few that we have enjoyed more. On our most recent trip to the area we were leading our first Small Group Tour of Tuscany. One of the evenings we ate at Ristorante Daria in the little village of Monticchiello. The main dish for the evening was Bistecca alla fiorentina and we asked Daria to select a special wine for us. She brought us a Lunadoro Vino Nobile Riserva and it was outstanding! The rich flavors of ripe plums, currants, some minerality, and dusty tannins paired perfectly with the very rare, very tender, very juicy steak. I’m getting hungry just thinking about it! There is something very special about drinking wine in the backyard of where it was produced. We have had both of these wines in other settings and while they were still very good, they just didn’t compare. This is what we want to share with you. Good wine is a reflection of the families that farm the grapes and the soil it grows in. The stories of these families, these vineyards, the weather the year it was produced, the cellars where it was aged all come together and it’s what makes searching for and finding great wine even more rewarding. This traditional producer is perennially a critic’s choice. If you want a sure fire introduction to Brunello, this is it. This is one of our favorite wineries to visit in the area. It is in a beautiful setting north of Montalcino with a clear view back to the village. Their wines lean toward a more modern style and the 2012 vintage was a celebration of their 40th harvest. We first tried this wine at a tasting at Jimmy’s in Dallas. We now have a wonderful tour, tasting, and lunch at the winery on our Small Group Tour of Tuscany. The first Vino Nobile we were able to find at home after our first trip to Tuscany. It is a big luscious wine and quite a bargain. We were introduced to this wine during our tour of the area last year. They are a small producer focusing on environmentally sustainable farming and biodiversity. This family run winery began in the 1960’s. They produce traditional Vino Nobile but are also experimenting some with Merlot, Cabernet Sauvignon, and other international varieties.